I just got back from another Misión en el camino (in April I wrote about a Misión en el camino to El Cocuy). These trips are designed for a small group to go to another church to support them and their different ministries for a week. Last week was a very full week. Four of us from Bogota went to Trinidad, about a 13 hour bus ride. We accompanied the woman's group, children's group (similar to Sunday to School), youth group, we lead an activity at the CasaDia (day home for elderly), did some painting and yard work, and made several house visits to members of the congregations. From the moment we got there until the moment we left, we were busy. It is almost impossible, at least for me, to write about the whole week (well), so there are a few highlights I would like to share. The first is the Sunday morning. Sunday morning, before worship, we had a party for the children of the church and children in the community. These are parties that we have encouraged every congregation to have this year as a way to grow their children's ministry. Part of my role with the Christian Formation has been to accompany and support/help with these parties. We gave all the formation leaders of each congregation ideas for the party including a skit idea, games ideas, etc. So for this party (and other ones I have been at, we of course follow our own plan). We painted our faces before hand so it would feel more festive, and for a skit we did for the kids. During the fiesta (party) for the kids we had games. Adi lead the games and had all the kids laughing, involved, and having a great time in about three minutes. We did a skit, which was also a new type of Spanish for me - improv acting. We did a craft and then had a snack. After the snack we took our group picture, and then we gave everyone their party favors. I always enjoy the energy and life that children have. Below: A close-up of the chinchorro (photo credit - Katie). Another activity we participated in was at the CasaDia, day home for the elderly. We lead an activity called memory boxes. That went okay, but what really impacted me about the CasaDia was the conversations I had after our activity. In a large open room they have looms set up for the participants to make chinchorros (like hammocks, but a different material, for different climate). The chinchorros are all handmade, they are absolutely a labor of love. I sat and talked with Antonio. 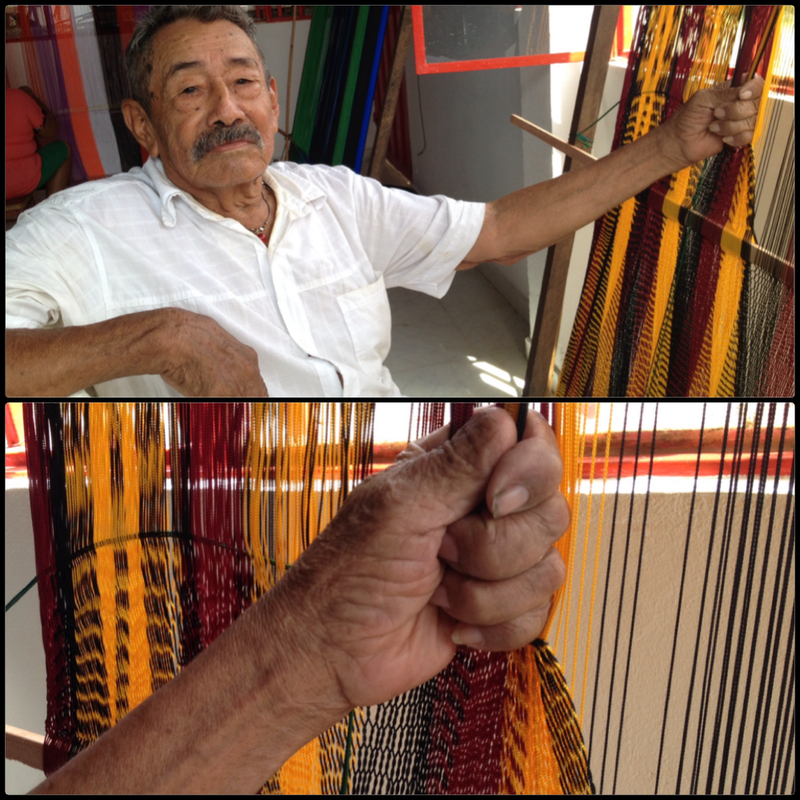 He showed me how the chinchorros are made, the different weaving patterns, and then we talked about his life. He had incredible stories to tell me about the different places he has lived, as well how the conflict in Colombia has affected his life. In one moment during our conversation, Antonio asked me what I thought of Trinidad, and mentioned it being "hot", I agreed, as the weather in Trinidad is hot, but that was okay with me, I liked the heat. He kind of looked at me and said no, hot with guerrilla. Ahhh, now I was caught up. The Llanos (the regionTrinidad is in) was a "red zone", high conflict, up until about 6-7 years ago (and there are parts that still are). This has affected the people there, their livelihoods, and the churches. I realize during these type of conversations the depth of the work that needs to be done AFTER there has been a peace agreement signed. The final highlight, or rather interesting thing to me, from the week....totally unrelated to the work we went there to do. We were doing some yard work, painting, and general fixes around the church property. I went to the kitchen to grab a glass of water, and while I was there the traveling, house medic came. Her job is to give the children vaccines. There is no clinic or doctor's office in Trinidad, so the most effective way to ensure children get their vaccines is for the medic to go to the houses (many of which are very rural). Two of the pastor's children were on the schedule for vaccines that day. 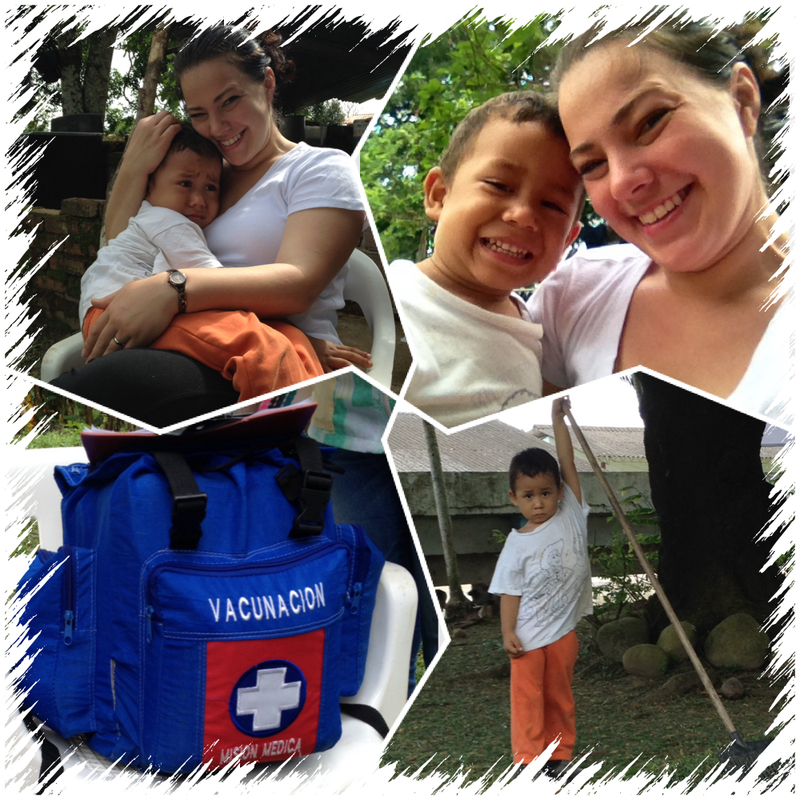 I sat with Emmanuel (Mamu, 3 years old) while we awaited his vaccines, and held him while he received them (he needed two). He cried before and during, but after it was all done I got a pretty big smile out of him. He went back to work helping us, but every so often remembered he had gotten the vaccines, and told us he just couldn't work, all I could do was laugh, how could I not looking at that face. It was a good week! 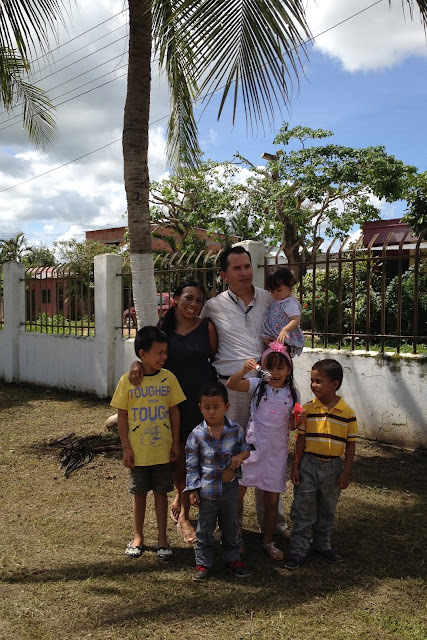 A huge thank you to Pastor Edwin and his family for hosting us for the week! Right before we left, as a thank you gift to us, Pastor Edwin presented everyone in our group with a poncho. These are typically warn in the warmer regions of Colombia. These were handmade by a member in the congregation.